Back in 2013, while I was working as Human Resources Director for the City of Medford, Oregon, I was pleased to be asked to be an early reader of an interesting publication called APE: Author-Publisher-Entrepreneur by Guy Kawasaki and Shawn Welch. This was an amazing guide for budding authors and even experienced ones seeking to move into the digital age. 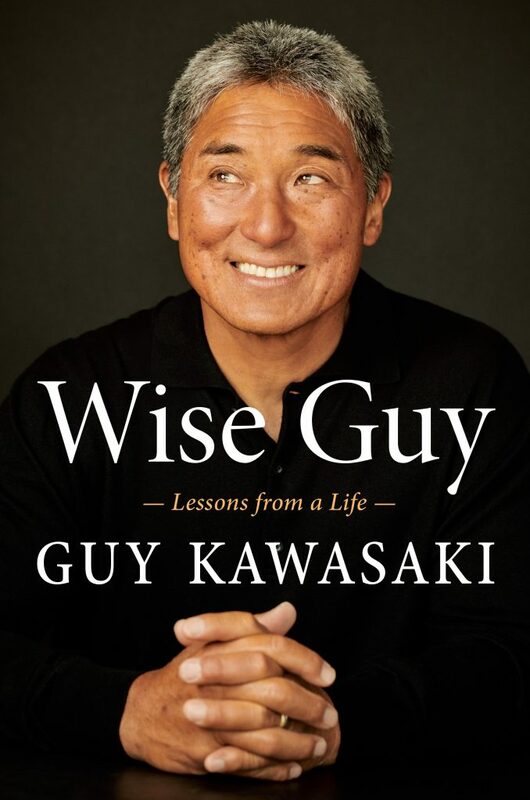 Of course, that meant I got added to Guy’s collection of followers, and this year, he asked if I’d like to join a group of reviewers for a pre-publication copy of Guy’s 15th book: Wise Guy, to be released Tuesday (Feb. 26) by Penguin Random House/Portfolio Books. Guy says Wise Guy is his most personal book, and is not a traditional memoir but a series of vignettes. It reflects a wide range of experiences that have enlightened and inspired him. He tells stories from his childhood in Hawaii, his education at Stanford and UCLA, his first job in the jewelry business, work for Steve Jobs at Apple, and his adoption of surfing at the age of 62. • Customers can’t tell you what they need. • Innovation happens on the next curve. • Big challenges beget big accomplishments. • Changing your mind is a sign of intelligence. • Price and value are not the same thing. • But value isn’t enough. • Some things need to be believed to be seen. While expressing that he “made a mistake” at not returning for a third tour when asked by Steve Jobs to run Apple University, he clearly says if he had stayed at Apple, he wouldn’t have started companies, become a venture capitalist, advised dozens of other entrepreneurs and written more than a dozen books. • Get high and to the right (be unique and valuable). • Adopt a growth mindset (among others, he recommends Carol Dweck’s book Mindset, which is a fascinating work of its own). • Embrace grit (achieving success is hard work). • Smile (there’s no such thing as being too nice). • Raise the tide (life is not a zero-sum game). • Pay it forward (do good works and make the world a better place. • Never lie, seldom shade (lying takes too much time and energy). • Enable people to pay you back (fostering self-worth in others). I thoroughly enjoyed Wise Guy, and enthusiastically recommend it. Tagged with experience, Guy Kawasaki, leadership, sharing. My great-grandmother Francelia Roblee descends from one of the “Old World” families whose actual surname is a mystery as there were so many speling variations in the New England colonies. But we are prety certain she descended from Reuben Robble who marroed Phebe Austin. For 20 years now, I have exchanged information on the Roblee families with a number of other researchers–most notably Cindy Walcott–and maintain a site for Roblee researchers. No sooner had the “ink dried” on work correcting the title of Cindy Walcott’s compilation on the Descendants of Reuben Robblee and Phebe Austin when but Cindy decided to update the report again to correct formatting errors and a few others discovered after we had a chance to review it. It is in keeping with the general philosophy that all family histories are works in progress and need frequent, and constant revision. As an example, Cindy and I exchanged updated information on one of Reuben Robblee’s descendants–my 2nd great-grandfather Norman Roblee (1815-1900), who married Henrietta Adelia Soule. A publication on the Soule family describes the birth of “Harriet” Adelia Soule (1816-1908) and an unnamed twin daughter. For many years I belived this simply to be a naming error by the Rev. G. T. Ridlon, author of the 1926 two-volume history of the Soule family (including descendants of Mayflower passenger George Soule). Because I had so many other mysteries in my family (still unsolved example: who were the parents of my 4th great grandfather Nathaniel Winslow, and how are we related–if at all–to the Mayflower passenger Edward Winslow?) I didn’t bother attempting to identify the twin daughter until recently. And then, when I did discover that Henrietta’s twin was actually named Harriet Adelia (yes, they appear to have been given identical middle names), and identified her family using online cemetery records. But I neglected to share this with Cindy (with whom I’ve shared cross-continental electronic correspondence for many years) until motivated to do so after reading her updated Descendants of Reuben Robblee (and wife Phebe Austin). I would ask that anyone using this report not turn “speculation” into “fact” when using the data for his or her own purposes. I welcome any questions, criticisms, confirmations, rebuttals, etc. My interest is in placing all individuals in their own families, locations and historical context. I welcome documentation that would help me to turn those into fact, or establish that my guesses or estimates were wrong! There are other additions and revisions to be made in these compilations, and I’m gratefiul for the revisions Cindy has continued to make. Posted in Detling Family History, Roblee Researchers. Tagged with Phebe Austin, Reuben Robblee, Roblee. Tagged with Bunker Garrison, Durham, graveyard. The City of Eagle Point’s City Council earlier combined the duties of the City’s Parks and Recreation and Economic Development Commission into a nine-member Community Development Commission, and tonight appointed eight members. I was happy to be appointed to a term that runs until December 31, 2019. Previously I served from March 2016 on the Parks and Recreation Commission. However, officers of the Bunker Family Association are not pleased to see our little bit of paradise being thrust into the limelight. The peaceful Bunker graveyard is now a destination for wandering trekkers and explorers, hell-bent on finding Valentine Bunker’s 1852 death date. Thoughts of vandalism and/or tombstone desecration, is a source of “grave” concern – we are devastated. Elsewhere on the Bunker Family Association web site, pictures of previous acts of vandalism and storm damage are shown. Hopefully, visitors to Bunker Creek will respect the final resting place of our ancient ancestors. The trail on this property begins behind the barn and leads you to the Bunker graveyard. This property has three major wildlife habitat attractions. The shoreline along Bunker Creek is prime waterfowl nesting habitat. The large white pine trees along the creek are potential eagle perch sites. The upland is maintained as shrub habitat, being rotationally mowed to sustain the habitat type, important to so many wildlife species. Directions: East on Route 4. Take a left on Bunker Lane, park in the designated area. Access the trail to the left and behind the barn. As you stand next to the historic barn, envision this property as a working farm owned by the Bunker family over 200 years ago. You may still be able to see a piece of old farm equipment, fruit trees that surrounded the house or even the cellar hole of the old farmhouse. The area behind the barn is maintained as shrub habitat. You may notice that sections have been mowed, keeping only fruit and nit bearing vegetation such as dogwood cedar and apple trees. The habitat is essential for species like woodcock, ruffled grouse and cottontail rabbits. Follow the trail behind the barn and end up at the sign to the Bunker Graveyard, a fenced in, quarter acre parcel that is the final resting place for 28 members of the Bunker family. To the left of the graveyard is what is historically noted as “Dirty Slough,” a small creek that flows through the salt marsh into Bunker creek and eventually into Oyster River. A garrison, circa 1655, was built by James Bunker on a knoll to the west of the graveyard and at one time was staffed by two soldiers. The garrison was said to be standing in 1892. Find the date Valentine Bunker died. Locate the cellar hole of the Bunker farmhouse. Watch for cottontail rabbits and listen for ruffled grouse drumming. Discover the “spiny” locust and “burly” ash trees. The PDF file is also available here. Tagged with BFA, Bunker Garrison, graveyard. Regular readers of my site will know that among my other interests, I manage the web site of the Bunker Family Association, a non-profit organization devoted to preserving and expanding the family history of the Bunker surname. I can trace my ancestry to James Bunker, the progenitor of one of the major Bunker family groups (sometimes call the “Devon Bunkers” after that area of England. Tagged with Bunker, family history. This WordPress site is now active with Secure Socket Layer (SSL) security implemented. Please note that the correct way of accessing the site is by entering https://www.detling.us. Anne Jennings Brazil was thoughtful enough, since we are distantly related and both interested in family history, to send me a copy of her first book (she’s already hard at work on a new one) as a Christmas present. I read through it in an afternoon, and was fascinated by her stories of relatives growing up in the same part of California where my mother’s family settled. It is amazing the similarities in the history of our ancestral family. If you are interest in family history research, or even California history in the 20th Century, this is a nice collection of stories.